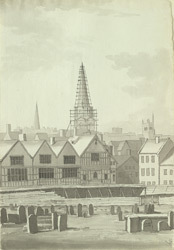 A view in ink of St James' Market at Bristol in Gloucestershire, drawn in the summer of 1788. In the 18th century, Bristol was a great trading city. It became prosperous because of its position between Dublin, Wales, Somerset and North Devon. Daniel Defoe visited Bristol in the early 18th century and commented 'the shopkeepers in Bristol who in general are all wholesale men, have so great an inland trade among all the western counties, that they maintain carriers to all the principal countries and towns from Southampton in the south, even to the banks of the Trent north. In the distance are a number of church spires.